The Crochet Plaid Cape is my way of bringing plaid into spring. The traditional red plaid is beautiful and I have used it for the Buttoned Plaid Cowl and Buttoned Plaid Scarf, but I wanted to do something a little lighter and pinker for Valentines day. It is quite easy to create a plaid combination. Just find two shades of the same color then add white as your lightest color. I have found a lot of plaid combinations can be made using Red Heart With Love Yarn. If you would like to see the 14 color combinations I have put together with Red Heart With Love yarn check out this post and let me know in the comments below the colors you are making your crochet plaid cape! Last year I made the Simply Spring Baby Dress and loved every detail. This year the Crochet Plaid Cape will be my baby accessory of choice. If you love the crochet plaid cape, check out my Free Patterns Page to see all my patterns and some of my favorites below. I do not count the turning chain as a stitch. Check out the diagram below to get a better understanding of how the plaid pattern works up. I will refer to the three color of the plaid design as the Light Color, Medium Color and Dark Color. R1: Dc in the third ch from the hook, Dc in the next stitch, 2Dc in the next stitch *Dc in each of the next two stitches, 2Dc in the next stitch* repeat from *to* across. R2: Ch2, turn, *Dc in each of the next 3 stitches, 2Dc in the next stitch* repeat from *to* across. R3: Ch2, turn, *Dc in each of the next 4 stitches, 2Dc in the next stitch* repeat from *to* across. R4: Ch2, turn, *Dc in each of the next 5 stitches, 2Dc in the next stitch* repeat from *to* across. R5: Using Light Color, Ch2, turn, *Using the Light color, work one Dc into each of the next 4 stitches, Using the Medium color, work one Dc into each of the next 4 stitches* repeat from *to* across. R6: Using Medium Color, Ch2, turn, *Using the Medium color, work one Dc into each of the next 4 stitches, Using the Light color, work one Dc into each of the next 4 stitches* repeat from *to* across. R7: Using Medium Color, Ch2, turn, *Using the Medium color, work one Dc into each of the next 4 stitches, Using the Dark color, work one Dc into each of the next 4 stitches* repeat from *to* across. R8: Using Dark Color, Ch2, turn, *Using the Dark color, work one Dc into each of the next 4 stitches, Using the Medium color, work one Dc into each of the next 4 stitches* repeat from *to* across. R9: Using Light Color, Ch2, turn, *Using the Light color, work one Dc into each of the next 4 stitches, Using the Medium color, work one Dc into each of the next 4 stitches* repeat from *to* across. R10: Using Medium Color, Ch2, turn, *Using the Medium color, work one Dc into each of the next 4 stitches, Using the Light color, work one Dc into each of the next 4 stitches* repeat from *to* across. R11: Using Medium Color, Ch2, turn, *Using the Medium color, work one Dc into each of the next 4 stitches, Using the Dark color, work one Dc into each of the next 4 stitches* repeat from *to* across. R12: Using Dark Color, Ch2, turn, *Using the Dark color, work one Dc into each of the next 4 stitches, Using the Medium color, work one Dc into each of the next 4 stitches* repeat from *to* across. R13: Using Light Color, Ch2, turn, *Using the Light color, work one Dc into each of the next 4 stitches, Using the Medium color, work one Dc into each of the next 4 stitches* repeat from *to* across. R14: Using Medium Color, Ch2, turn, *Using the Medium color, work one Dc into each of the next 4 stitches, Using the Light color, work one Dc into each of the next 4 stitches* repeat from *to* across. Note: For the Baby size skip rows 15 and 16. R15: Using Medium Color, Ch2, turn, *Using the Medium color, work one Dc into each of the next 4 stitches, Using the Dark color, work one Dc into each of the next 4 stitches* repeat from *to* across. R16: Using Dark Color, Ch2, turn, *Using the Dark color, work one Dc into each of the next 4 stitches, Using the Medium color, work one Dc into each of the next 4 stitches* repeat from *to* across. Note: If you want a longer cape just continue repeating Rows 13-16 until you reach your desired length. R17: Using Dark Color, Ch2, Dc in each Stitch across. Fasten off. To clean up the edges, I Slip Stitches to one of the corners, Chained 1, and worked 2Sc into the side of every Dc. Fasten off at the end. To finish up use your embroidery floss and yarn needle to sew two buttons at the top of the cape. I just use the spaces between the Double Crochet stitches to fasten the buttons. For this pattern you will be repeating Rows 5-8, but I have written out each row for your convenience. R1: Dc in the third ch from the hook, Dc in the next 2 stitches, 2Dc in the next stitch *Dc in each of the next two stitches, 2Dc in the next stitch* repeat from *to* across. R2: Ch2, turn, *Dc in each of the next 4 stitches, 2Dc in the next stitch* repeat from *to* across. R3: Ch2, turn, *Dc in each of the next 5 stitches, 2Dc in the next stitch* repeat from *to* across. R4: Ch2, turn, *Dc in each of the next 6 stitches, 2Dc in the next stitch* repeat from *to* across. R17: Using Light Color, Ch2, turn, *Using the Light color, work one Dc into each of the next 4 stitches, Using the Medium color, work one Dc into each of the next 4 stitches* repeat from *to* across. R18: Using Medium Color, Ch2, turn, *Using the Medium color, work one Dc into each of the next 4 stitches, Using the Light color, work one Dc into each of the next 4 stitches* repeat from *to* across. R19: Using Medium Color, Ch2, turn, *Using the Medium color, work one Dc into each of the next 4 stitches, Using the Dark color, work one Dc into each of the next 4 stitches* repeat from *to* across. R20: Using Dark Color, Ch2, turn, *Using the Dark color, work one Dc into each of the next 4 stitches, Using the Medium color, work one Dc into each of the next 4 stitches* repeat from *to* across. Note: If you want a longer cape just continue repeating Rows 17-20 until you reach your desired length. R21: Using Dark Color, Ch2, Dc in each Stitch across. Fasten off. To clean up the edges, Slip Stitches to one of the corners, Chained 1, and worked 2Sc into the side of every Dc. Fasten off at the end. 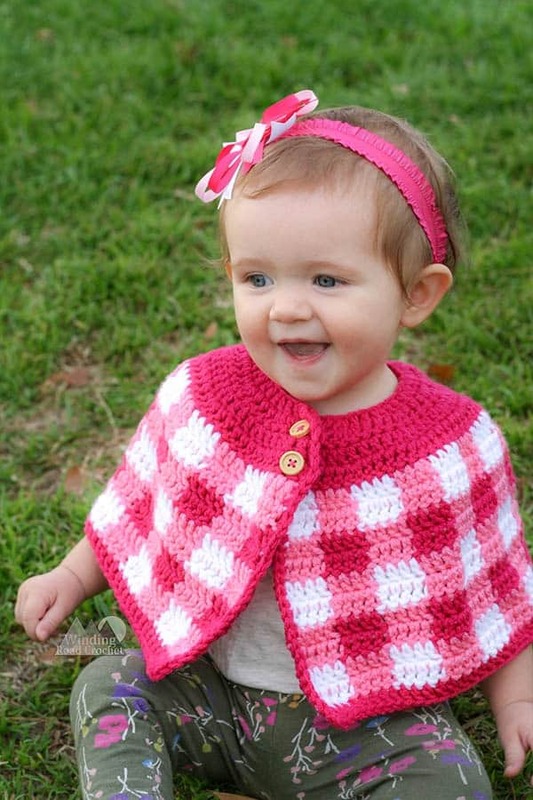 Your Crochet Plaid Cape is complete and ready to make the little girls in your life warm and adorable. Are you going to make a Crochet Plaid Cape for someone you love? I would really like to see your finished cape. Take a picture and share it with me on any social media! Just tag me @windingroadcrochet, #windingroadcrochet, or #ourcrochetjourney. Join my Facebook Group and share your creation with the community at Our Crochet Journey Facebook Group! Written pattern, tutorials, graphs and pdfs of the Crochet Plaid Cape are copyright Windingroadcrochet.com. Please do not reprint or repost this content as your own, but please feel free to share this link with others. You can find more information on sharing my work with others in the Terms and Conditions Page. Love the C2C crochet along so far. Looking forward to stitch a day February. Have a question about which laminator you use to laminate the bobbins. Have been looking for one but some of the information is confusing and was just wondering how you picked yours. This is SO cute, what a darling little pattern. So adorable! Thanks for sharing with us at the Snickerdoodle Link Party! So do you cut yarn off every four stitches?? That’s a lot of ends to weave in!